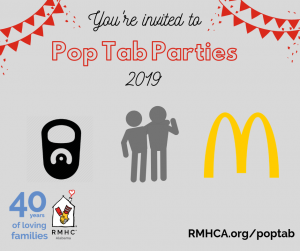 RMHCA Car Tag Vouchers Are Out! 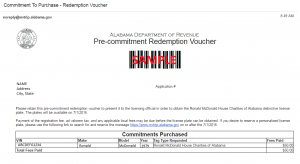 On May 24th, 2016, the official Ronald McDonald House Charities of Alabama car tag voucher was sent out by the state DMV. If you signed up in the first 1,000 pre-commitments, you should have received an email on the morning of the 24th (that will look similar to the one below). If you were in the first 1,000 and did not get an email from the state, cannot find the email, or need it resent for any reason, please call Beverly at (334) 242-9006. We are so excited that the car tag will be available on July 1st, 2016. Throughout this entire process, there have been many questions. We want to make having the RMHCA car tag an easy choice, so we hope to make it as convenient as possible. Below are some of the questions we have received regarding the voucher, please read over them to determine if your concerns are addressed. I did not get the email with the voucher from the state, but I did sign up in the first 1,000 pre-commitments, what can I do? Call Beverly at (334) 242-9006 and tell her your name, she will resend the email to you. If your email address has changed, please let her know. I did get the email with the voucher from the state, but I can’t find it now? I sold my car that is on my voucher and have a new car, can I get the RMHCA car tag for my new car? Yes, the DMV will check your name and address and allow you to update the car associated with the voucher at the time of redemption. I moved and am no longer at the address on my voucher. Can I still get the tag? Yes, let the DMV know at the time of redemption and they will update your information. I moved and got a new car, but I have my voucher. Can I still get the tag? Yes, let the DMV know the changes upon redemption. Can I specialize/personalize the text on the tag? My tag renews (enter a month before July 2016), can I get the tag before July 1st? No, the tag will not be at DMV offices until July 1st. If you renew in May or June, you can renew and then take the voucher to the DMV in July to redeem and get the tag OR you can wait until you renew in 2017. Please talk to the DMV about your options. My tag does not renew until (enter a month after July 2016), can I get the tag before by renewal month? You can. The first year is paid for beginning the next time your renewal is due. If you choose to get the RMHCA tag before your next renewal date, you can do so for free but for at the following renewal period, you will have to pay the specialty tag fee in order to keep the RMHCA car tag. For example, if you renewed in January 2016 but you decide to go ahead and get the RMHCA tag in July of 2016 you will be required to renew in January 2017. If at that time, you want to keep the RMHCA car tag, you will be asked to pay the specialty tag fee to keep it during 2017. My tag does not renew until (enter a month after July 2016), can I wait to get the tag then? Absolutely. If you wait until your car tag is up for renewal, you can use your voucher to get an entire year for free. What happens when my ‘free’ year for the car tag is over? We would love for you to renew the RMHCA car tag. It will have a $50 specialized fee, but $41.25 of that comes back to the charity. I did not sign up for the tag in the first 1,000, can I still get it? Yes, we would love for you to purchase a RMHCA Speciality Car Tag! When you go to renew your car tag, just let them know at the DMV you want to support Ronald McDonald House Charities of Alabama. Is it really free? No questions asked? Yes! 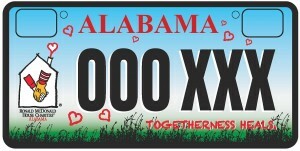 RMHCA footed the bill for the first 1,000 pre-commitments in order to get the car tag into production. We will get $41.25 back from each of those 1,000 who signed up. Upon using your voucher, you will have to pay regular taxes, but you will not have to pay for the specialty car tag. Still have questions? Contact Laurie Smith at laurie.smith@rmhca.org or (205) 638-7269.